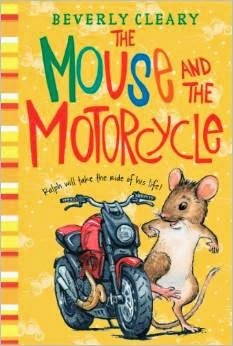 (Summary taken from amazon.com) “In this imaginative adventure from Newbery Medal-winning author Beverly Cleary, a young mouse named Ralph is thrown into a world of excitement when a boy and his shiny toy motorcycle check into the Mountain View Inn. I read every single Beverly Cleary book when I was younger, and this was definitely high on my list of favorites! My daughter’s second grade class read this for their last book club of the year, and we had a fun time with it. I actually read it to her because of time constraints, but she could have read it by herself. We liked it so much, in fact, that I went and got the second one from the library. Anyway, it’s just a cute story about a mouse and a little boy. They meet and become friends, and Keith (the boy) allows Ralph (the mouse) to ride his motorcycle around the hotel. Ralph is just a kid mouse and does some irresponsible things, but ends up proving his worth at the end. It’s written well and is easy to read and understand. It has a fun story line that kids like because every kid wants a mouse friend, right? And kids love hotels and the magic that surrounds travelling. Keith is a cute kid that is likable and realistic. I didn’t love his mother in the story, but I’m pretty sure I’d have a lot of her same sentiments if I were in her position. Ralph drove me crazy some of the time, but he learned some good lessons and turned out ok. There are some very good lessons taught in this book: friendship, responsibility, attitude, and doing hard things are a few of the lessons learned. This is a great book for silent reading or a read-aloud. Recommendation: Second grade and up as a silent read, preschool and up as a read-aloud. I remember reading this book when I was a child. I think I'm going to introduce it to my daughter now. Thanks for sharing! I'm so glad! I was excited to introduce it to my daughter, and I am so happy she enjoyed it. I hope your daughter enjoys it as well! Happy Reading!